Since it is already the middle of October, I thought I’d better get working on my 30 before the end of my 30’s list. Last night, we got all dressed up for my son’s birthday dinner, so I thought it was the perfect time to take a few Fashion shots. I’ve always wanted to do a fashion post, as I’ve been interested in Fashion since I was a little girl. Dressing up in my mom’s old clothes was a favorite pass time, and as I grew up, I even did a little (very little) modeling. Unfortunately, I am short, and destined never to be a Super Model. However, that doesn’t mean I can’t pretend sometimes. So, I had my husband take a few shots of me last night before we went out, and I discovered a few things. I am very, very pale. Modeling is not as easy as it looks. I really need to color my hair. I need to study more fashion posts before I do this again. Without any further ado, here are some pictures for your viewing pleasure or amusement. I had been looking for the perfect jumpsuit forever. Finally, since I’ve lost some weight and clothes aren’t uncomfortable anymore, I can shop at H & M, and I found this Black Jumpsuit on clearance. It was $6!!!! How could I pass it up?!?! I accessorized it with a necklace from Banana Republic, and booties (which I’ve had for years) from Macy’s by Marc Fisher. Also, since we live in Wisconsin, no look would be complete without a coat. I found this awesome animal print at Target, also on clearance. If I’m going to buy something trendy, it has to be cheap. This is not an affiliate post or sponsored in any way, but just for me to have some fun. Let me tell you what is not fun…what I am doing right now while you’re reading this. I am having a scope done to check on my acid re-flux and my esophagus. It’s an annual check that I have needed since having been intubated when having a c-section with my twins. Now, the doctors have never told me it’s related, but I never had acid re-flux or damage to my esophagus before. At my first and second scopes, they have found Barrett’s Esophagus, which is a pre-cancerous condition. There is nothing they can do but medication and monitoring my diet right now. So, if you have time, send a few good thoughts my way this morning. And thanks for indulging me in my fashion post. Hope you’re having a great Thursday. Awe. Thank you. You should! You look lovely! I love that jumpsuit – it’s very cute. Really cute jumpsuit! I’m hoping you get some good news and answers at the doctor’s today! That’s a cute outfit Shann! I wish it was an affiliate link because I really want one and I think yours is cuter than the H&M one. I know! I wish I had an affiliate link too! I am jealous that you can pull that off, you look fantastic! Love the jumpsuit, you look so confident in it! Love that jumpsuit – looks super comfy! You are too cute! You look amazing 🙂 I can’t believe that gorgeous jumper was only $6! I love outfits that are one piece. It saves me time and a headache of trying to put together the perfect outfit. Clearance finds like that are the best! And it looks great on you! I’m always too short to pull off outfits like that. Yes, LOVE clearance. I’m pretty short too. I usually have to cut off the bottoms of my jeans. This surprisingly wasn’t that long. I think you look lovely! What a steal on that jumpsuit. I need to study more fashion posts too. I always take pictures for my Stitch Fix reviews but feel so awkward about it! Oh my gosh you look stunning! Going out of your comfort zone works for you. I especially LOVE the jumpsuit. Very very great – you have such a pretty face, hair and style! You look sophisticated in these pics – but beautiful! You are adorable! The jumpsuit looks fantastic on you! That jumpsuit looks great on you! What a steal only being $6! That’s awesome! I need to start doing more fashion posts of my blog as well, but I hate how I look sometimes in photos. I hope everything goes well with your appointment today! I could never do this because I can’t take serious pictures and also, Matt is the worst photographer EVER. You looked great on that romper! 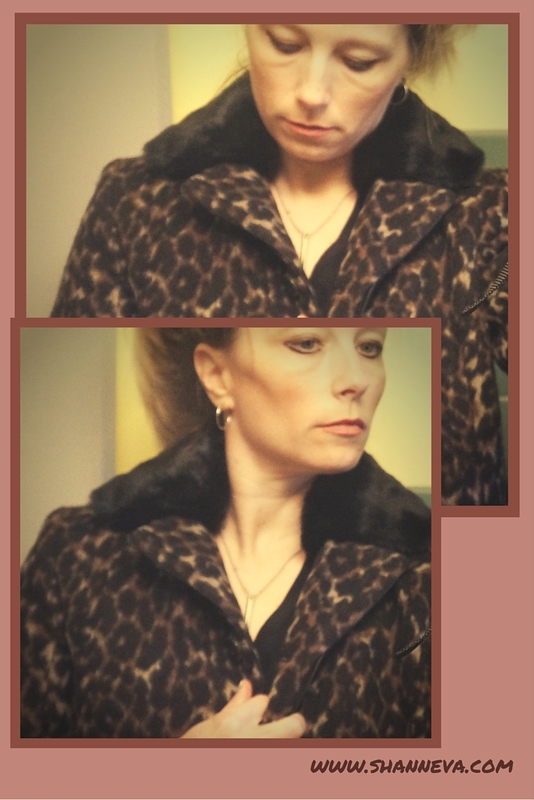 The leopard coat was a nice touch by adding that pattern! That jumpsuit is awesome and what a steal! I am currently trying to find one too. It’s so hard to find the right one! I love leopard coats. I have a new one that will be great to wear when it gets cold. Thanks for the fashion post! Way out of my comfort zone too! I think it’s a cute jumpsuit and I like your modelling. Congrats on loosing so much weight you get to go shopping! It’s not easy! Thank you! It really is not easy, you’re right. Love porcelain! I’ll have to start using that too 🙂 It took me quite a while to find one that fit right because they all have really long legs. This one worked well, and I could wear it even without heels. I love that jumper it looks super cute! I like the poses you did. I think you did very well! Refreshing to see something other than the “little black dress.” You look very nice. I can’t imagine the anxiety over having a scope done and the chance of cancer. I will definitely keep you in my thoughts. Love the jumper. Andy Cohen would be dying over your outfit. You look fantastic and great in jumpsuit. I think you should do more fashion finds! What a cute outfit it looks perfect on you. I want his for me. Those are great finds. You look gorgeous! That jumpsuit suits you well! You look so slim. You could totally pass off as a fashion blogger! Aw but this looks fabulous!!! Hope your appointment went ok! And I think you look fab in your pics. Pale is the new tan!!! Pale is the new tan….I LOVE that! Thank you. I’m pretty short too, and surprisingly the legs weren’t too long on this one. Too cute! Thanks for reminding me about H&M – we’ve had one in town for a while and I keep forgetting to head there for fun cool finds – heading there today! That looks fabulous on you! I’m hoping for good results with your testing, by the way. Thank you so much Liz. I really appreciate that. First, I’m sending positive vibes and prayers your way Shann. I love this jumpsuit and you are so rocking the leopad coat! I hope the meds help! Take care of yourself. You are right fashion shoots arent as easy as you would think, but they can be fun. Hope your acid reflux gets better. I really like that jumpsuit! As a very tall girl, it’s hard to find one that fits so you are lucky to be able to go to H&M. Also…yes fashion posts are a lot harder than they look, and I hear you on the pale thing! :). Way to get out there and try something new though. Looks great:). Thank you so much! Isn’t it funny how it’s hard to find being short too? I wonder who they are making these jumpsuits for? You look GREAT! And that black romper is ADORABLE. I can’t believe you found such a good deal. I’m kind of short so rompers are hard for me, I have to find ones of all the same color from top to bottom and this one is great. I am going to try to see if they might have any more, or at least something similar. Thanks for inspiring me to try a new look! Sorry to hear about the esophagus problem – sounds like the same problem my Mom had. I think you did great with the modeling and I love the jumpsuit! Thank you, and thanks for the tips . You are so brave! I’m entirely not photogenic but may have to push my boundaries and give it a try. Your outfit is too cute, you definitely do this again. Awe. Thank you so much . What awesome finds! I’m typically not a fan of jumpsuits, but you can rock that one really well! And even better: it looks SUPER comfortable. Such great finds! I love that jumpsuit. Ah. I wasn’t sure what made you choose that post, but now it totally makes sense. Thank you so much!